It's October and up here in Canada, that's canning season for all that garden produce you've harvested from the garden before the frost hit, or managed to hide under old blankets and such to prolong the growing season. You've probably canned all the fruit as it came in, and frozen the corn, peas, and beans, but there's still the carrots, leeks, beets, and other root vegetables, and all those tomatoes you've tucked away to ripen between layers of newspapers. 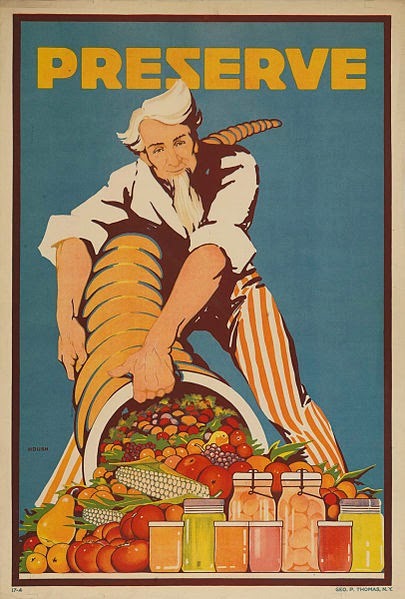 This wonderful poster on food preservation has this notation: World War I-era poster shows Uncle Sam pouring out a cornucopia full of fruit and vegetables. Jars of preserve stand in the foreground. Published by Geo. P. Thomas, N.Y.; Artist: Housh, ca. 1917-1919. The jars were closed, but not too tight as the sealing process needed room for air to escape in order to avoid food spoilage. 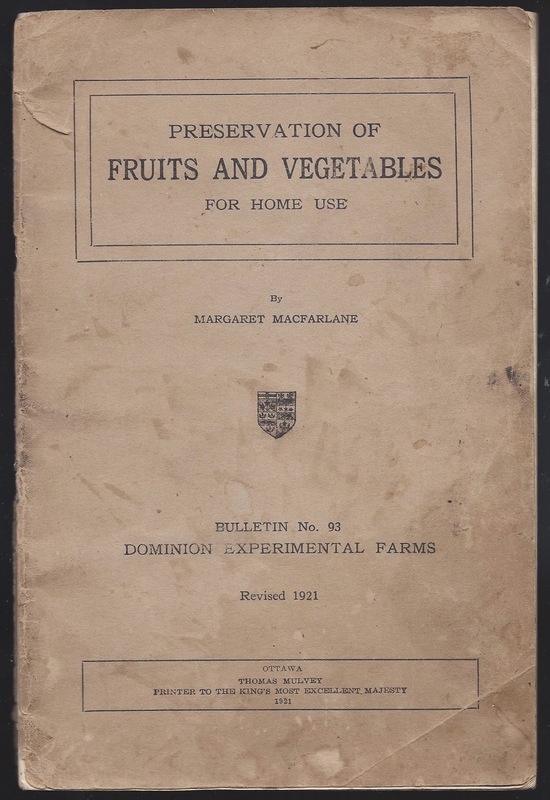 I recently acquired a 6.5 inch x 10 inch 51-page booklet published as a revised edition in 1921 by Margaret Macfarlane under the authority of the Dominion of Canada Department of Agriculture. 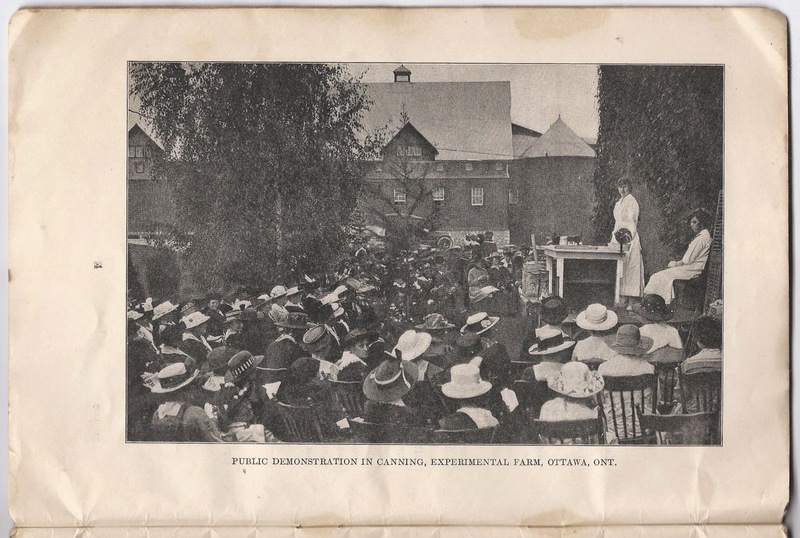 Each of the ten Canadian provinces contained an Experimental Farm where they would test horticulture products to see which grew best for their soil conditions, climate, etc. 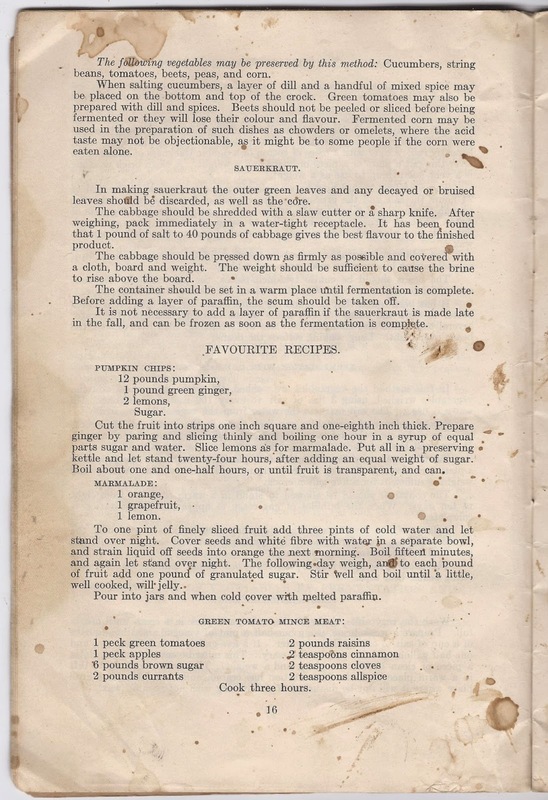 This particular booklet contains information and recipes based on food preservation testing in 1917, 1918, and 1919. Unlike today where recipes specify exact cooking and sealing times for safety reasons, this booklet shows, "the different methods tried so as to impress on those who are about to preserve fruit and vegetables the necessity of adopting the best methods." Note the photo on the top right where she's placing the jars upside down... it took a lot of nerve for me to do that before I understood the sealing process of the water bath canner. Of course, some foods like meat and meat sauces must be sealed via the pressure canner like in the bottom right pic, but since I was always scared it would blow up on me, I only took that route when my husband was there to run that particular piece of preserving equipment. 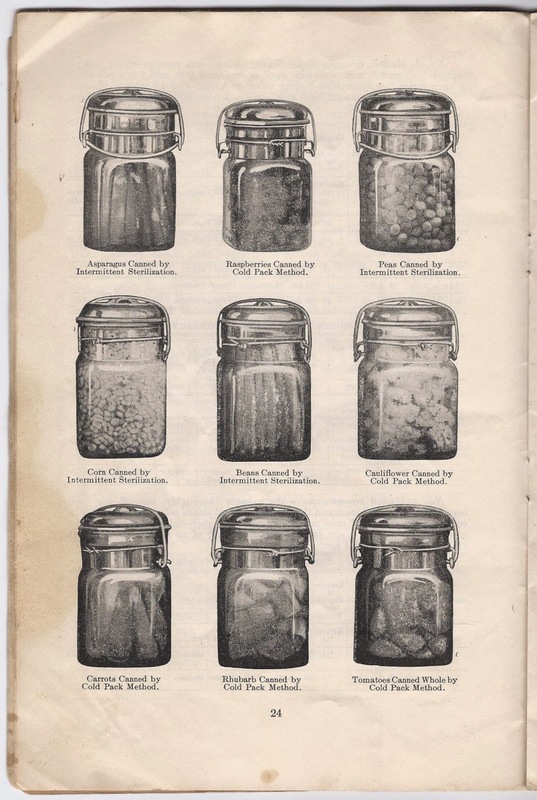 If you're researching post-WW1 food facts, this booklet would be a great asset as it not only gives the best method of preservation, including 3 drying methods, but it also shows how long sealed jars last when canned under certain conditions. You may be someone who likes looking at rows of colorful jars, but is the food inside safe? You often see the pint jars in the above photo as made with blue glass and are quite the collector's items now. Although I'm a sucker for blue glass, I wouldn't use one of these jars for actual food preservation as I'd be too worried about breakage. I'd rather show them off beside the old copper boiler, albeit dented and blackened from use and age. If you started at the top of the page and are wondering what method they're talking about for the Sauerkraut, the previous page says it's the Fermentation in Brine Method. If you're interested, I have a similar recipe for Green Tomato Mincemeat on my recipe blog which uses different portions and thus makes a smaller batch requiring only requires 2 hrs to cook. When Christmas comes, I open a jar, spoon out the mincemeat into store-bought frozen tart shells, and pop them into the oven. No suet, no fuss, good eating. My maternal grandma grew her own grapes, boysenberries, raspberries and strawberries, then she made her own jams and jellies. We would take pomegranates off our tree to her and she would make pomegranate jelly which was awesome! She also made her own relish. We have a lady in church who grows everything you can think of in her garden and then cans them. She also puts up pickles every year and she always shares everything with the pastor and his wife (that would be my husband and me). Cindy, what a blessing to receive the fruits of labor from someone in your church. It makes the food that much tastier when you know the effort involved. As for your grandma, that must've been a great smelling kitchen. I've had pomegranate, but never in a jam/jelly form, and I don't believe I've had boysenberries in any form. However, my Finnish grandparents introduced us to Lingon berries and that's what I have on my toast whenever I'm visiting my mom. Deanna, it sounds like a good video for AFV but I would've been bawling if it had happened to me. Sorry I'm so late answering. I had tech trouble on the 5th and then forgot to come back and check due to all the social media promotion of the Christmas Cheer books. My grandmother made jams and jellies and preserves, but since we lived in the city, we had no garden. After I married and visited my husband's family in Arkansas, the myriad colors of the jars of canned vegetables fascinated me. I did learn to make jelly and preserves from my grandmother, but I no longer make them. I do have a collection of Mason and Ball jars that I use for various other things now in my cooking. Thanks for a very interesting post. You're welcome, Martha. And sorry for the late reply. I know that people say you can garden in the city, but I've lived in urban and rural places and I always found the former a frustrating gardening experience. Probably because I always had a big garden because I liked growing not only a variety of veggies, but actual different varieties of those veggies. I canned over 600 quarts a year for my family of eight. Many happy memories were made as we all chipped in to help preserve our food supply for the long Maine winters! 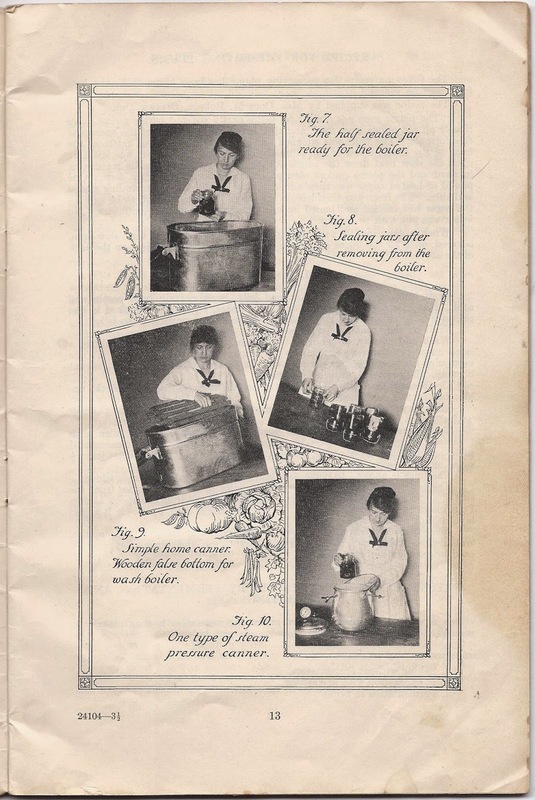 We still have an applesauce canning tradition as well as jelly. I also collect old canning jars! 600 quarts? Goodness, Lisa, wherever did you store it all? And how many days vacation did you take when canning season was over? Yeah, I know... there was no time for rest when there's a family of eight. Kudos to you for calling it happy memories. It reminds me that although I didn't like doing dishes, some of the best conversations I had with my mom and sister happened while we were cleaning the kitchen.